This is the first article in a bimonthly series where we will look at the most selling brands in the fashion industry in the year 2016-17. Interbrand, a global brand consultancy, reported Best Global Brands of 2017. Ten luxury and apparel companies made their mark in the top 100. Each blog post would probe into these companies for environmental and social performance by highlighting their progress. Stay tuned for this bimonthly series looking into their sustainability efforts. Ranking on Best Global Brands of 2017: LOUIS VUITTON is at 19 and DIOR is at 95 out of 100. Fashion Transparency Index Final Score: 11-20% Brands scoring between 11-20% are likely to be publishing a majority of policies, some procedures and information about their supplier assessment and remediation processes. Total scores were out of 250 possible points, which we have converted into percentages. Fashion Revolution choses to publish percentages rather than each brands' individual scores because they felt it encourages readers to focus on emerging patterns rather than exact details. Third party verification of report: Yes. ERNST & YOUNG et Associés. Reporting Standard: The information set out in its document also reflects the guidelines in Version 4.0 of the Global Reporting Initiative (GRI). LVMH Moët Hennessy Louis Vuitton SE, better known as LVMH, is a European multinational luxury goods conglomerate, native of France and headquartered in Paris. LVMH was one of the first groups to set up its own Environment Department – in 1992, the year of the Earth Summit in Rio. In 2017, the Group’s Environment Department will celebrate its 25th anniversary. Louis Vuitton and Dior are a part of this same group. LIFE 2020 (LIFE (LVMH Initiatives For the Environment)) launched in 2016. It’s Environment Academy trains employees on eco-design. It’s online materials library introduces designers and developers over 300 “ecofriendly” materials. Introduction of LVMH Store Environment Awards event. In 2016, the total amount of the Group’s purely environmental expenditure was €23.8 million, including: €13.5 million in operating expenses, and €10.3 million in investments. 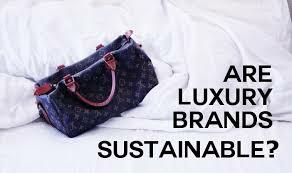 Louis Vuitton is set to increase its environmental budget by 50% between 2016 and 2017 compared with 2016, and has decided to make significant investments in eco-design, in the environmental responsibility of its procurement chain and in managing CO2 emissions relating to the transportation of its products. LVMH launched the second version of Edibox in 2016. This is an Internet tool developed in-house that calculates the environmental performance index (EPI) of packaging, as well as the CO2 impact of packaging materials. Louis Vuitton has been involved in saving bees by supporting scientists and local voluntary organizations for several years. New Krug box launched, a new packaging range for customers in Louis Vuitton stores, which is made out of FSC-certified paper that includes over 40% of recycled fibers. To recover a portion of its waste, LVMH uses the CEDRE (Environmental Center for Environmentally-Friendly Packaging Elimination and Recycling) platform. CEDRE treated and recycled 2,023 metric tons of extremely diverse waste in 2016. Louis Vuitton, sent packaged items to the platform, including out-of-date alcohol based products, advertising materials and testers used in the stores, as well as empty packaging returned by customers, etc. Furthermore, Louis Vuitton used the platform to recycle textiles. “Refills” are a way for LVMH to extend the lifespan of its products. For instance, Parfums Christian Dior has been developing this concept for many years. They began by applying it to its premium ranges. Nowadays, 80% of the serums and creams that it launches are refillable. This factor is reflected in the saving of 600,000 liters of water and about 11.6 metric tons of waste every year for the Capture Totale cream alone. Parfums Christian Dior pursued this initiative in 2016, when it marketed its new DreamSkin Perfect Skin Cushion cream in refillable packaging. Louis Vuitton teams use digital models and 3-D printing, from the design stage to the industrial manufacture of the products. By offering the opportunity to view the many different possible arrays of colors and materials in a realistic manner, these tools fine-tune the preselection of the models to be prototyped and enable savings on materials. Louis Vuitton uses geothermal power, for heating and cooling the staff’s common rooms and offices and intends to roll out an innovative heat recovery system at one of its sites. In Poland, Parfums Christian Dior chose LED lighting to light its new boutique that was opened in Warsaw in 2016. Parfums Christian Dior’s formulae contain over 60% of plant-based ingredients. The Maison ensures that its procurement is sustainable in order to protect this essential asset.